Boeing issued a statement directed at its South Carolina workforce claiming that opposition from the Machinists union to Norwegian Air International’s plans to add U.S.-Europe routes could put jobs at risk. Boeing on Tuesday weighed in for the first time with a definitive public statement on a hot political controversy in the aviation world — choosing to use the issue as a stick to try to beat back the Machinists union’s efforts to organize its assembly plants in South Carolina. A strong coalition of the biggest U.S. airlines, labor unions and politicians — mostly Democrats, including Hillary Clinton — has mounted a protracted and vociferous campaign to have the Department of Transportation block Norwegian Air International from expanding in the U.S.
Norwegian flies Boeing 787 Dreamliners across the Atlantic and is rapidly adding U.S. routes with the goal of introducing low-cost fares on prime international routes such as Paris-New York and London-Orlando. That prospect drew fierce opposition from American, Delta and United as well as labor unions representing pilots and other airline workers — and including the International Association of Machinists (IAM) — who claim Norwegian would pay lower wages. Boeing has now finally come out strongly on Norwegian’s side, though with an indirect argument. On an anti-union website aimed at its South Carolina workforce, the company Tuesday criticized the IAM’s opposition to Norwegian’s planned expansion. “IAM Leaders’ Actions Could Cost Boeing New Orders” is the headline of a statement on the website, which Boeing set up as a central information source for its South Carolina employees when the union began trying to organize the workforce. Because of the heavy political opposition within the U.S., the Department of Transportation delayed for more than two years granting Norwegian a foreign-air-carrier permit, which it needs to give the airline full freedom to fly where it wants. In April, the Department of Transportation finally granted Norwegian tentative approval, citing the 2007 Open Skies agreement between the U.S. and the European Union. 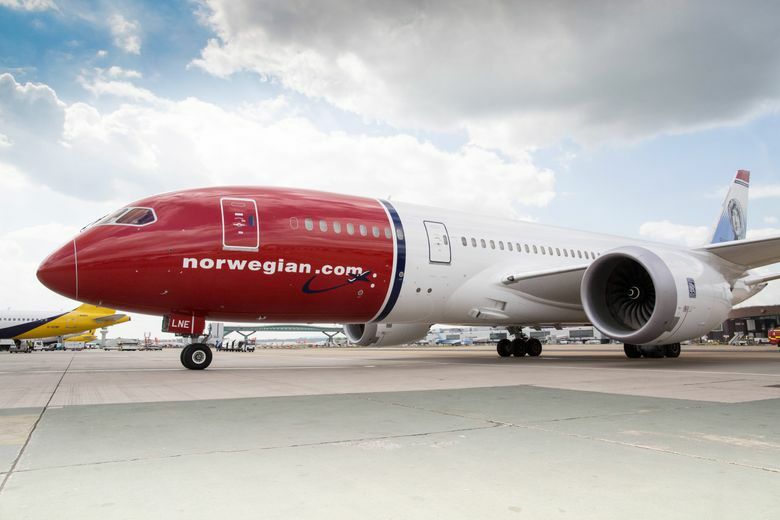 “There appears to be no legal basis to deny (Norwegian’s) application,” the department said. U.S. Rep. Rick Larsen, D-Everett, the ranking Democrat on the House Aviation Subcommittee, immediately criticized that move, saying he was “deeply troubled” and demanding that the U.S. maintain “strong labor standards” in the airline industry. In late April, Larsen co-sponsored a pending bipartisan bill to block the final approval of Norwegian’s permit. Nationally prominent Democrats also voiced their support for the labor unions, including both Bernie Sanders and Hillary Clinton. Labor groups have refused to accept Norwegian’s assurances that it pays the going rate to flight crews wherever they live. Through all this controversy, Boeing kept mostly silent until now. Earlier this month, a company spokesman speaking to The (Everett) Herald expressed disappointment with the position of Larsen and the IAM. But while the jet maker is a strong proponent of the Open Skies treaty, which has expanded air travel by opening up competition, it did not previously issue a public statement supporting Norwegian, a carrier with more than 150 Boeing 737 MAXs, 737-800s and 787s on order. Yet the statement on Boeing’s South Carolina website contains no argument based on support for the Open Skies treaty and the principle of whether airlines should be allowed to operate freely. Instead, it frames the issue narrowly as a matter of putting the orders from Norwegian at risk of cancellation, thus threatening jobs — and so touts the IAM position as a reason for its South Carolina employees not to trust the union.